I can't pretend to be anything other than thrilled at the way the tour is selling - especially given that it's still a fair few months away. I couldn't really believe it last month when I was told that several of the shows had already sold out and that they wanted to add 9 more nights. And now - with the tour still 8 months away - we're adding a further 7. I know some people find it a bit frustrating that the extra dates are in venues that already had the show - so I can only say that I'd love to playing in all four corners of the country... but I can only go where the show is booked. And it sort of stands to reason that the easiest gigs to add to a tour are ones at existing venues which have sold out 8 months in advance... it's venues who've already put faith in the show responding to the demand they're witnessing. The Lowry Centre in Salford is one of the ones that has a new date. Indeed we've now added three extra shows there. Which means a huge amount to me because Manchester was my home town for many years and is where I started doing stand up. I mention that one in particular because of the email they sent to their punters mentioning this new, extra date... which contains a bit of misinformation. 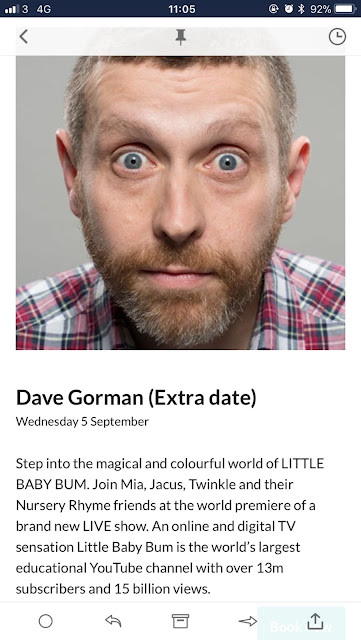 If you come along, please don't expect to be stepping into the magical and colourful world of Little Baby Bum. That won't be happening. Not on purpose anyway. Anyway, the full list of dates - including the extra 9 and the extra, extra 7 are all on my website.